Offering you a complete choice of products which include multipoint inoculator agar dilution, pcr thermal cycler, multi tube vortex mixer, multi-tube vortexer shaker and mini thermal cyclers. 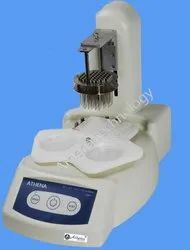 Athena series multipoint inoculator is the specific instrument for experiment of bacterial resistance (agar dilution). It can automatically finish inoculating in 9 seconds. The whole process is simple, fast, and accurate. 1. Special design and processing eliminate inoculation rod’s hydrophobicity and avoid bacterial solution dropping when sampling. 2. Sterilization processing method simple. Rapid inoculating, reducing the working strength, and avoid errors. 3. Easy and fast to operate. The inoculation speed is fast and adjustable. Achieve the rapid test bacterial solution. Special design of sample tray can adjust rotating. 4. 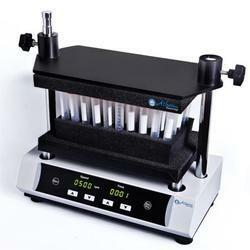 Speed which can automatically positioning, changing sample to directly inoculate without any more operation. 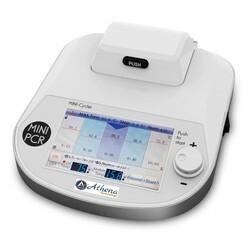 Product description: ATC-16/ ATC--32 series Mini PCR instruments is an ultra-light ultra-thin thermal cycle gene amplification instrument. Using 5-inch TFT high-definition true color full touch LCD screen, the whole program displays in real time with curve graph, parameter modification intuitive and convenient. Using the latest generation of semiconductor heat pump technology, excellent temperature accuracy and uniformity and have extremely high temperature change speed, to ensure high-quality experimental results. Mini portable can be used on-board. 1、New and unique appearance, the interface operation is simple and convenient, ultra-light ultra-thin, mini portable can be used on-board. 2、The latest generation of semiconductor technology, excellent augmentation performance, effectively eliminate the edge effect of module heat conduction, the module temperature uniformity excellent. 3、Fast heating/cooling rate, maximum can attain 5℃/S. 4、The bottom shell with one aluminum carved processing, not only quasit and solid, but also greatly enhance the heat dissipation performance. 5、5-inch TFT full HD touch screen, real-time accurate display temperature curve and the instrument running process status. 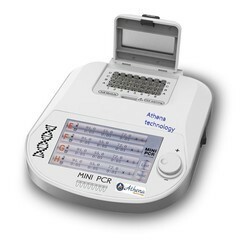 6、Friendly & intuitive interface, a shorter time to complete the PCR program parameter setting, convenient & fast. 7、Hot cover can be opened and closed at any time, higher compatible controllability. 8、Program built-in 16 groups commonly used parameter settings, the list flip page preview invoke, convenient and fast. 9、There are 4x8 type modules (unique 8 PCR tube strips compatible modules) combination model optional, to meet more experimental needs. Microprocessor control, simplistic designed appearance, LED display the speed and time. Humanized program design, built-in short mix and timing operation modes. Operation stable and silent. Large orbital vortex, performance effective. Various types of foam tube frames and pads for option. 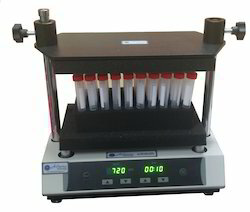 Product description: AT-2500 Multi-Tube Vortex Mixer can process 50 samples at once.. a variety of accessories can be selected for your choice to meet the mixing needs of different specifications of test tube .Humanized program design, built-in two operation modes : short mix and fixed timing ,which make the experiment more convenient and efficient. Looking for Life Science Products ?